March 19, 2016. One of my favorite things about international travel is comparing the passenger experience in different airports and aboard various airlines. For example, in Chicago’s O’Hare airport, employees motor through the terminals on golf carts, while in Oslo’s Gardermoen, they zip along on kick scooters, and in Amsterdam’s Schipol, they race around on bicycles. A kinda creepy CGI family does the safety demo on SAS flights. Likewise, the difference between the airline safety announcements can be quite entertaining. For American Airlines, the flight attendants stand in the aisles and act out the appropriate safety protocol. On SAS, computer-generated cartoon families set the stage via video monitors. But my new all-time favorite safety announcement is that made by Turkish Airlines. Turkey’s terrific travelogue highlights both sightseeing and business opportunities in the country. First, the monitors display travelogue footage of stunning Turkish scenery, which ends with the quirky tagline of “Turkey: Discover the Potential.” Seems like you might want to brag about more than just potential, but okay. Then, the instructional video begins by showing a gorgeous Turkish family (far more beautifully attired than the typical sweatpants-wearing American family) preparing for their flight. Oddly, the safety procedures include the dad removing his tie and loosening his collar and the mom kicking off her shoes while the adorable baby plays with the inflatable vest. But my favorite moment comes when the video illustrates what to do during an emergency situation. As the father assumes the position, the narrators says: “Upon the command ‘brace for impact,’ bend over and grab your ankles.” Okay, so he actually says ‘hold your knees,’ but still, the line sounds so much like every Turkish prison reference I’ve ever heard that I have to believe the joke was intentional. I laughed until I cried. 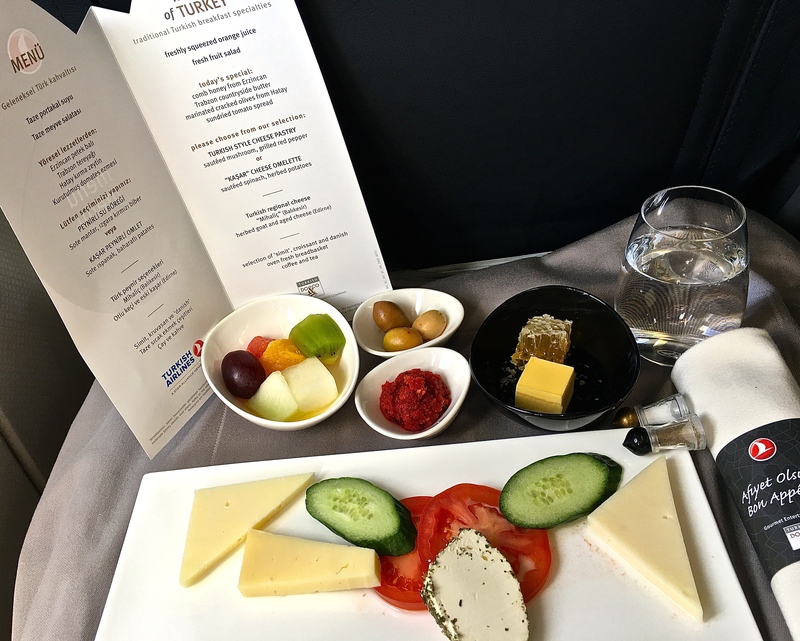 Check out the menu and fabulous delicacies offered aboard Turkish Airlines — Yum! The fun continued with awesome Turkish music played throughout the cabin while drinks were served. And then the meal arrived. The flight attendant had provided a menu (!) with a choice of breakfast options involving two different courses (!!) Having wolfed down a breakfast burrito at the airport before the 6:00 a.m. flight, I went with the “light” selection including a sampling of Turkish cheeses, olives, country butter, and honey still in the comb. Absolutely incredible. How surreal is this? Turkish Airlines partnered with Warner Brothers as the sponsor for Batman vs. Superman. This YouTube clip features “millionaire Bruce Wayne” (Ben Affleck) talking about “Metropolis” being a hot travel destination. The four-hour flight continued to impress me with Turkish tea, coffee, and breakfast treats like the sesame-based halva, plus incredibly friendly, attentive staff. And all this at economy class rates. 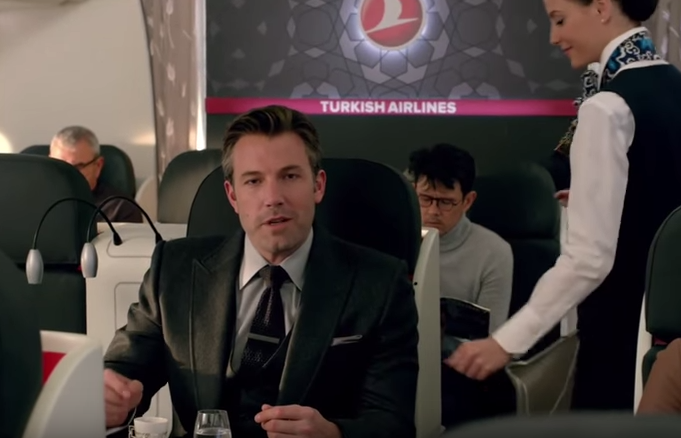 I know that, due to the current political climate, Turkish Airlines has been doing a big promotional push lately (witness the trailer for Batman vs. Superman). But you gotta give credit where it’s due, and I’d say that the Istanbul flight was probably the most luxurious, relaxing trip I’ve had since my first and only business-class upgrade. Anyway, I digress. As we entered our landing pattern, I got my first glimpse of the city. Even for a girl who has spent 20 years living in crowded Chicago, Istanbul’s density is overwhelming. I could easily see how it might accommodate a population of 15 million. From the air, structures ancient and modern appear to be shoehorned into every available space. The Bosphorus itself hosted a mind-boggling number of ships and freighters sprinkled over its surface like a huge flock of seabirds. Istanbul ranks as the 7th largest city globally, and the largest city in Europe. It sits along the only sea route between the Mediterranean and the oil-rich Black Sea, meaning that it hosts one of the busiest waterways in the world. Upon landing, Matthew and I caught a cab, an interesting experience on its own. It reminded me a bit of a taxi ride I once took in Egypt, where the driver relied primarily on his horn for traffic control as he rode up on sidewalks, ran red lights, and went the wrong direction down one-way streets. Luckily, we didn’t hit any pedestrians in Istanbul. I can’t say the same of my cab ride in Cairo, where the driver managed to mow down three people over the course of our journey. Each rolled across the hood of the car and disappeared from view, only to pop up again and give a jaunty “I’m okay” wave before scampering off. But that’s a story for another day. 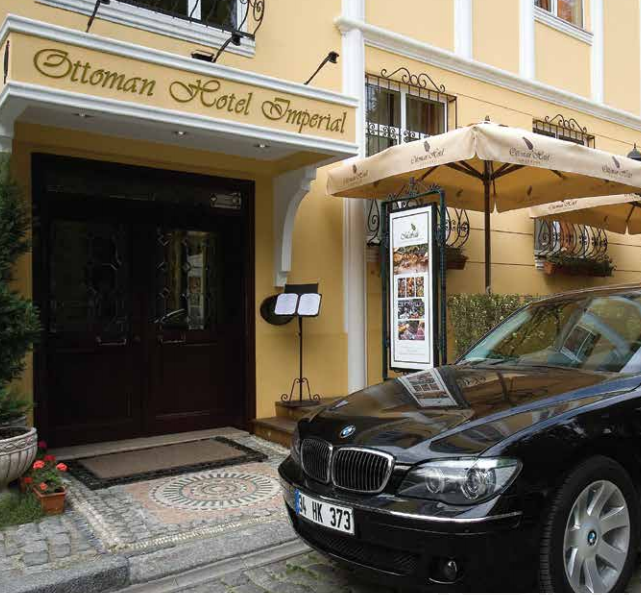 We arrived safe and sound at our hotel, the elegant Ottoman Hotel Imperial, located steps from the Hagia Sophia. The manager welcomed us and offered tea and Turkish delight while he reviewed Istanbul’s top sights and how to get there. When it came to Taxim Square, he simply said, “I’d stay away from here for the next couple of days; a political demonstration has made it an unsafe area.” We assumed he was referring to recent clashes between police and the Kurdistan Worker’s Party and had no idea of what had transpired during our flight. I took this photo later in the week, when the street vendors had a few more customers. Since we’d had an incredibly busy work week and only four hours of sleep the night before, Matthew and I hit the hay immediately and took a three-hour nap in our hotel room. After awakening, we squeezed in a brief visit to the Hagia Sophia before closing time, and then wandered groggily around the atmospheric Hippodrome, filled with remnants from the Byzantine Era. 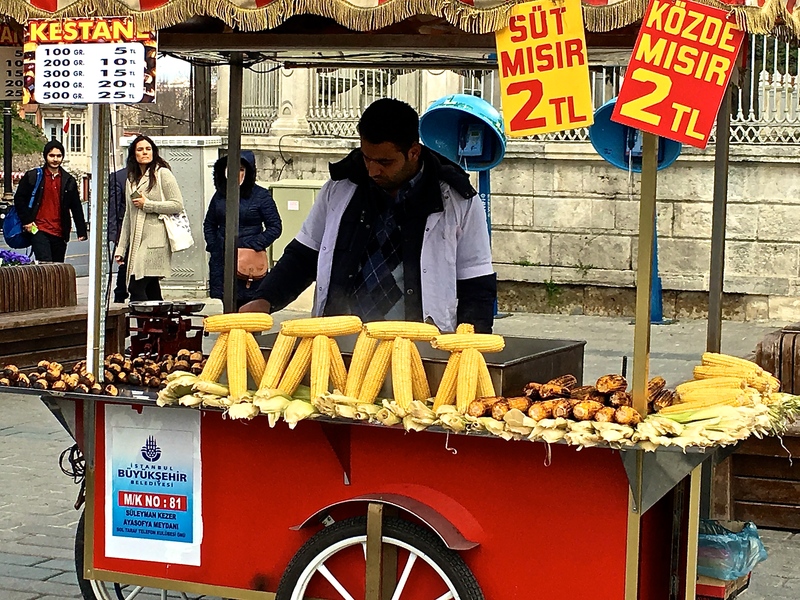 The smell of roasting chestnuts and grilled corn sold by street vendors wafted enticingly through the night air, but few people seemed to be on the sidewalks to take advantage of the treats. Note the knife that Denis, our fantastic server at the Bella Mira Cafe and Restaurant, used to crack open the clay pot. 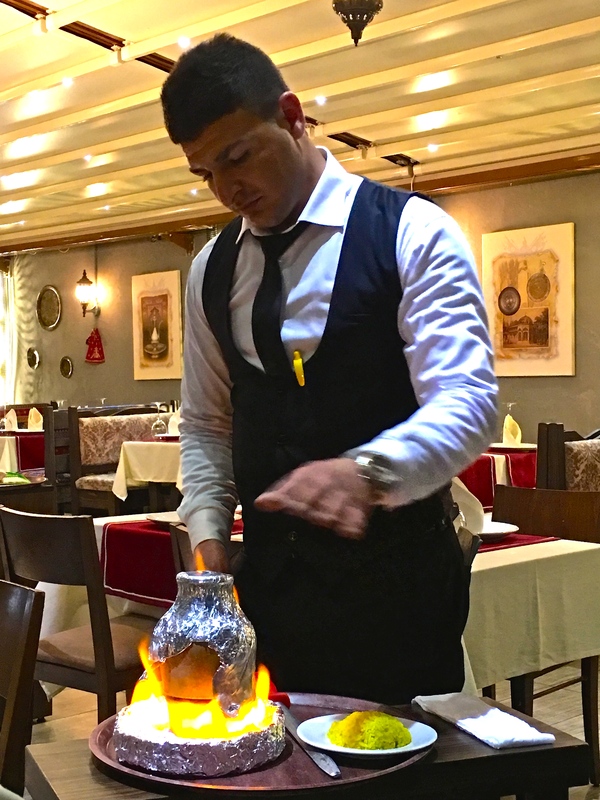 Eventually we stopped for supper at one of only a handful of open restaurants, where we tried pide (a kind of boat-shaped Turkish pizza) and güveç (chicken and vegetables sealed in a clay pot then cooked over hot coals.) Fabulous! But we were surprised to be the only folks in the place. We took a brief stroll after dinner, and found ourselves seemingly alone in the city. Where were the unbearable Easter Week crowds we’d been warned of? With the evening Call to Prayer echoing spookily through the deserted streets, and heavy skies hanging above, the vibe felt slightly ominous. So we headed back to the hotel and crawled into bed without turning on the television, no clue as to the tragic events of the day until we awoke the next morning….